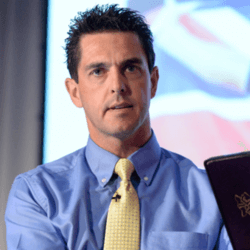 Keynote speaker Lewis Johnson is an NBC Olympic broadcaster with the experience of the athletes he interviews. Lewis was an all-star track and fielder in high school, and an All-American in college, University of Cincinnati, and made it to the Olympic trials twice. Though he didn’t make it to the Olympics by running on the track he made it by reporting on the games. 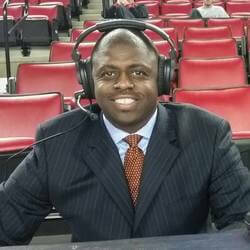 As illustrious as his collegiate athletic career was, Lewis has gained even more distinction as a network broadcaster of track and field, as well as many other sports for several different broadcast companies. 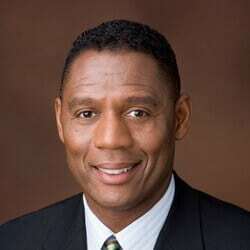 Speaker Lewis Johnson has worked 10 consecutive Olympic Games as an announcer for NBC, starting with the 2000 Summer Olympics in Sydney, Australia. His latest was the Olympic Winter Games in Pyeongchang, South Korea, where he also returned to work his third Paralympics for the network. For the Summer Olympics, Lewis conducts all the interviews at track & field, and at the Winter Games he typically works as the Reporter at Bobsled, Luge & Skeleton. He often speaks about his journey which includes his devastating disappointment of not being able to make the U.S. Olympic track team in 1988 & 1992, having long dreamed of and worked hard for that honor, but that his Olympic dream actually came true in a different way, as an NBC Olympic broadcaster. Speaker Lewis Johnson’s running accomplishments earned him entrance into the University of Cincinnati Athletic Hall of Fame in 1999 and the ultimate recognition from his alma mater when the University of Cincinnati awarded him an Honorary Doctorate Degree of Letters in their 2017 Spring commencement. Lewis’ unlikely journey to the Olympics which embraces subtopics of Achievement, Attitude, Empowerment, Inspiration, Motivation, Sports, Olympics and the University student. Approximately 90 percent of all Olympic athletes will never win a medal, and only one-third of them will stand on to top of the podium for Gold. So why do tens of thousands of athletes around the globe train & dream to be Olympians despite those odds? Maybe “the journey” is where many of them find their reward, their Gold medal. The audience will leave with a better way to embracing their story and finding ways to celebrate the very personal journey they are on, with the intention of reaching their goals and dreams.